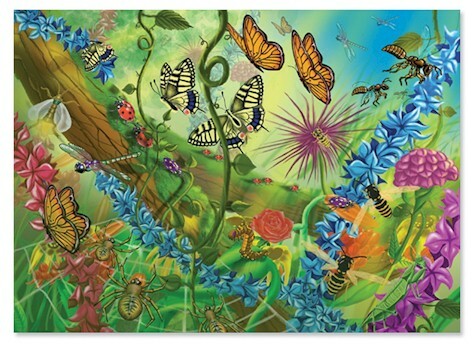 Amazon has marked this selection of 87 Melissa & Doug puzzles down by up to 30%, with prices going from $4.89 to $29.99. Of the 87 selected puzzles, 85 of them are priced under $15.00. None of these puzzles are Add-On items; they all ship with Prime or SuperSaver shipping, so Prime members can buy just one or two without having to load up your cart with a $25 purchase. Check out the Melissa & Doug 60-piece wooden jigsaw World of Bugs puzzle pictured above at only $4.89 with free Prime/SuperSaver shipping. Amazon has got this book of all 22 letters of the Hebrew Alphabet for only $1.29 with free Prime/SuperSaver shipping. This booklet got 4.3 out of 5 stars over 19 customer reviews. 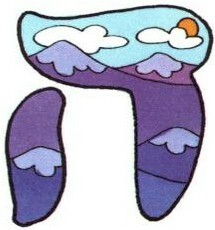 Description: Here's a fun way to introduce boys and girls to the Hebrew alphabet. 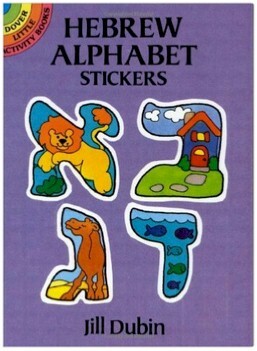 Twenty-two brightly colored stickers, each representing a different letter, contain an illustration of a word beginning with that letter: inside the clearly outlined letter "dalet" ("d") is a "dahg" (fish); the letter "zayin" ("z") contains a "zuh-AYV" (wolf). 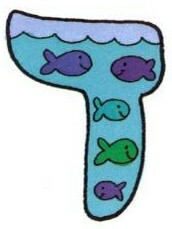 Ideal for use in the classroom or at home, these stickers will educate as well as entertain. 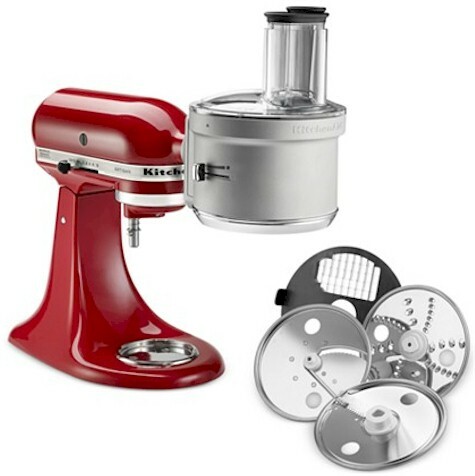 Description: Get processing with your KitchenAid Stand Mixer. The Food Processor attachment simply attaches to the hub of your stand mixer to dice, slice, shred and julienne your favorite fruits, vegetables and hard cheeses. The exclusive Exact Slice System allows you to slice from thick to thin with one slide of the lever. This set got 4.3 out of 5 stars over 2,802 customer reviews. 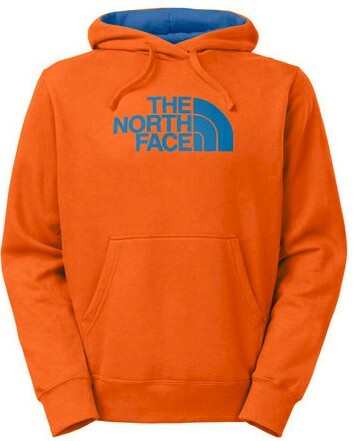 Gander Mountain has got this half-dome pullover hoodie from The North Face in "Burnished Orange/Snorkel Blue" for $34.96, but enter promo code SEASON25 and that price drops to $26.22 with free shipping. Sizes S, M, L, 2XL available. Amazon has this Hape Playfully Delicious Coffee Maker for $16.91 with free Prime/SuperSaver shipping. 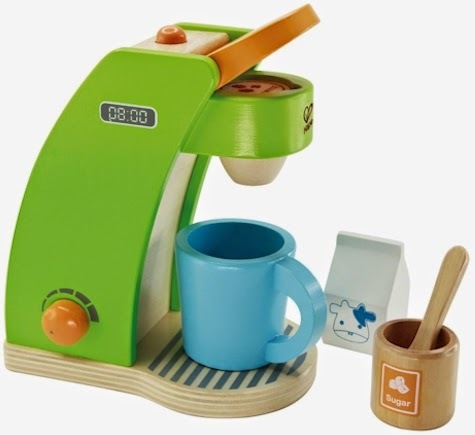 This high-quality toy looks very much like a play Keurig. It's a similar style to a KidKraft set, but at a much friendlier price. It got 4.8 out of 5 stars over 156 customer reviews, with 131 reviewers giving it 5 stars. 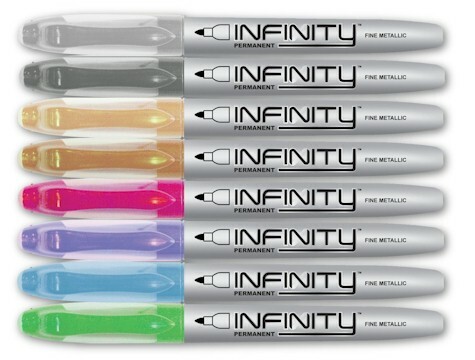 This set of 8-count Infinity Metallic Markers is priced at $4.99 on Amazon, only 20 cents more than the lowest recorded Amazon price on this set of $4.79. This is an Amazon Add-On item, which means that it ships for free with a $25 minimum order if you are an Amazon Prime member (and its price of $4.99 counts towards that $25), or it ships for free with a $35 minimum order if you're not a Prime member. If you like, you can order multiples of this item in order to help get you towards your $25 or $35 goal. This set received 4.3 out of 5 stars over 109 customer reviews. The average Amazon price on this set is $10.40. Amazon has got this set of 100-count Learning Resources Mathlink Cubes for $9.55 with free Prime/SuperSaver shipping, the lowest recorded Amazon price on this set. This highly-rated set received 4.8 out of 5 stars over 147 customer reviews. 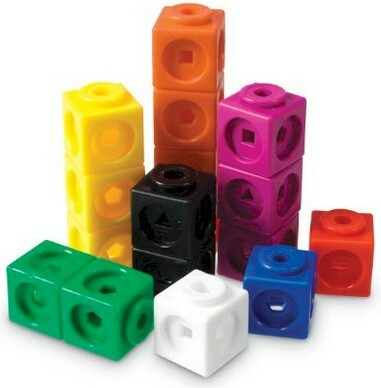 Description: Set of 100 plastic ¾" cubes in 10 colors link together on all sides so students can easily build and explore spatial relationships. Cubes feature geometric shape cut-outs for more complex patterning activities. Great for counting, sorting, measurement and graphing too. Compatible with other linking cubes. 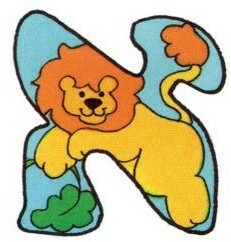 Grades K+. Save money and buy your Purim costumes early by taking advantage of this Halloween promotion: 20% off these Amazon costumes when you enter promo code TRICKTREAT at checkout. The licensed Harry Potter robe pictured above starts at $19.38 - 20% = $15.50 with free Prime/SuperSaver shipping. 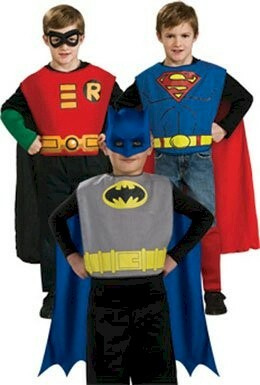 Or check out this licensed DC Comics Action Trio Child Costume Kit: includes a Batman tabard and headpiece, a Superman tabard and boot tops, and a Robin tabard, eyemask and gauntlets, all for $24.00 - 20% = $19.20 with free Prime/SuperSaver shipping. This is a limited time offer that expires on 10/4/15, so shop here and get all of your Purim costume-buying out of the way early this year. 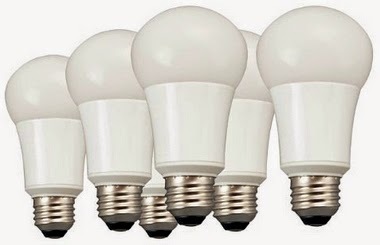 Amazon has got this 6-pack of LED 60-watt equivalent Daylight (5000K) light bulbs for $19.19 ($3.20 per bulb) with free Prime/SuperSaver shipping. These bulbs got 4.6 out of 5 stars over 1,373 customer reviews. They are temporarily out of stock, probably because of the price drop, but you can still order them and lock in the price, and they will ship in a few days when they restock. LEDs are much more efficient that incandescent bulbs and don't contain the mercury that you'll find in CFLs (though they do contain lead, please be aware). They also look like normal light bulbs and not spiral noodles from outer space. These bulbs come with a limited 3-year warranty. Because they last so long and run so efficiently, you will save money on electricity, buying new bulbs and will not have to change the bulbs every few weeks. We are almost an entirely LED-light-bulb-run household now. 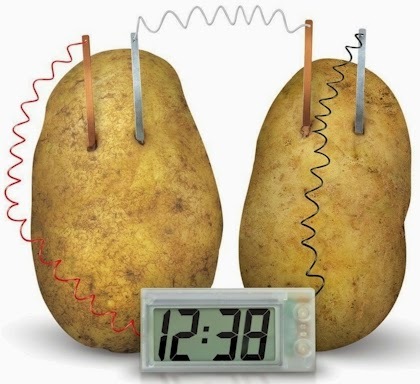 LOWEST PRICE: 4M Potato Clock (yes, a clock that is powered by potatoes) for $4.99. Great gift for kids interested in science or kids whom you WISH were interested in science! A clock that runs on potatoes? If you've got a kid who is a science enthusiast (or better yet, a kid who is completely science-phobic), 4M has these kits for kids, many for under $10.00 that will open up science concepts to him/her in fun ways. The 4M Potato Clock kit is just $4.99, the lowest recorded Amazon price on this item. It got 4 out of 5 stars over 147 customer reviews. And yes, it is an actual clock that runs on potatoes. No batteries needed, but you will need two potatoes. From reading the reviews, a small minority of purchasers were disappointed that the clock was not of high quality. Keep in mind that you are buying this kit to illustrate a principle (turning a potato into a battery), not to obtain a great clock. It's an Amazon Add-On item, which means that it ships for free with a $25 minimum order if you are an Amazon Prime member (and its price of $4.99 counts towards that $25), or it ships for free with a $35 minimum order if you're not a Prime member. If you like, you can order multiples of this item in order to help get you towards your $25 or $35 goal. 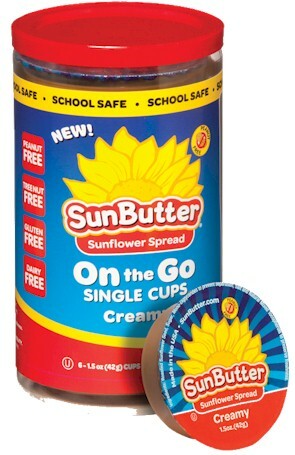 Request your free sample of SunButter on the Go from Target, here. For all of you kosher-keeping Daily Cheapskate readers, SunButter is under OU hashgacha (kosher-pareve). When you are answering their questions, please keep in mind that they are targeting young kids with peanut allergies who bring lunch from home to peanut-restricted schools, for this free sample, fyi. Today, 9/29/15 only (sorry for posting so late), Amazon's Gold Box Deal of the Day is up to 75% off wedding and anniversary rings. I found some beautiful low-priced choices, both in the 14-kt. gold and in the sterling silver variety. I already have a gold and diamond anniversary band but I fell in love with one of the lower-priced sterling silver ones with blue diamonds (see below), so I bought it! These all come with free returns, so if you (or your wife, girlfriend, sigoth, etc.) don't like the ring when it arrives, you can always return it on Amazon. Sterling Silver Pave Diamond Wedding Anniversary Ring for $39.99 with free Prime/SuperSaver shipping ad free returns. If a gold and diamond band is not in the budget right now, this is a great, affordable alternative, and the design on this one is lovely. I have one just like this for traveling (except I paid about $20 more). This ring normally goes for (approximately) $49.99. 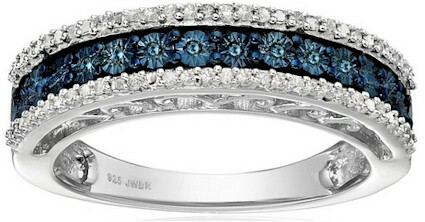 Sterling Silver Blue and White Diamond Anniversary Ring (1/10 cttw, I-J Color, I2-I3 Clarity) for $54.99 with free Prime/SuperSaver shipping ad free returns. I bought this one! I love the color and very elegant design, and for the price, it was quite a deal. This ring normally goes for (approximately) $74.99. 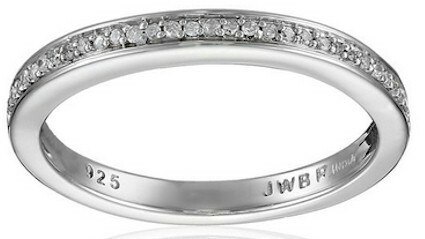 14K White Gold 2mm Comfort-Fit Diamond Wedding Band (1/10 cttw, G-H Color, SI1-SI2 Clarity) for $209.99 with free Prime/SuperSaver shipping ad free returns. Beautiful, modern design. 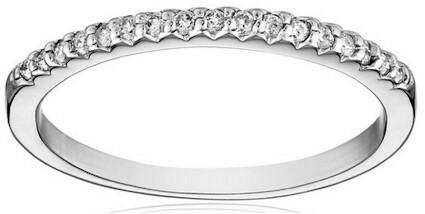 14k White Gold-and-Diamond "Stackable" Band for $224.99 with free Prime/SuperSaver shipping ad free returns. This ring normally goes for (approximately) $299.99. Shop around, but remember that these discounts are good today (Tuesday, 9/29/15) only. 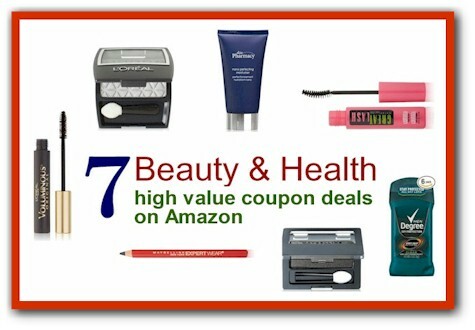 Amazon has released a whole bunch of new beauty, health and toiletries coupons that will enable you to get some items at a very high discount. Below are seven of the best values that I can find. These are all a high-sellout risk. UPDATE 9/29/15: Since some of these deals have already expired, I've updated them with some new ones. Request your free 10 oz. 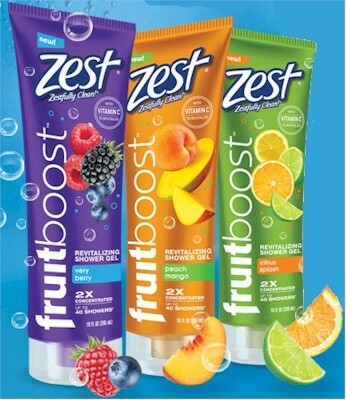 Zest FruitBoost Shower Gel here. Only select requesters will receive the freebie. 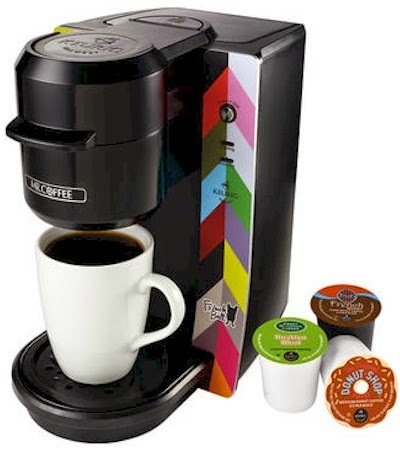 Have you been hankering after a pricey Keurig but find that the cost of a Keurig machine is just not in your budget? Here's a great deal on a Mr. Coffee Single K-Cup Brewing System, which is essentially the Mr. Coffee version of a Keurig for $44.99 with free shipping. This price is only good through the end of the month, 9/30/15. We just bought one of these for my husband's home office. You can also snag one now for Pesach (especially since some k-cups are now KLP). Your price will drop down to $44.99 with free shipping. Enjoy your new k-cup brewer! $7.41 or $0.93 per 16 oz. box of orzo with the 15% Subscribe & Save discount, if you can take delivery of 5 or more active subscriptions in one month. $8.28 or $$1.04 per 16 oz. 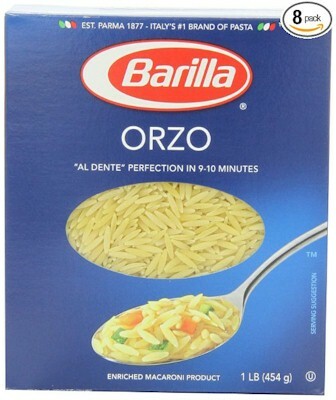 box of orzo with the standard 5% Subscribe & Save discount. 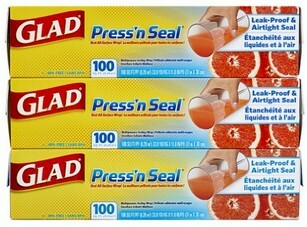 Amazon has got a fantastic deal on this 3-count of Glad Press 'n Seal 100 square foot rolls. Stack a high-value 30% coupon with a 15% Amazon Subscribe & Save discount, and you wind up with a 45% discount on the original price of $14.97, and you'll end up playing $8.23 with free shipping for all three rolls ($2.74 per roll shipped!). 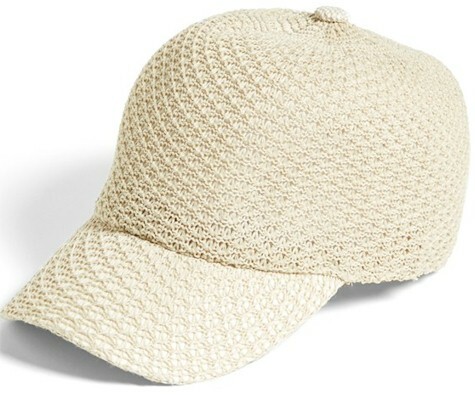 Nordstrom has got this crocheted openwork Collection XIIX 'Color Expansion' Baseball Cap on sale for 40% off at $14.40 with free shipping and free returns. 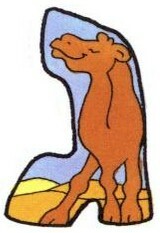 It comes in two colors: sand (shown) and aqua mist. It's got an adjustable hook-and-loop strap in the back for comfortable sizing. 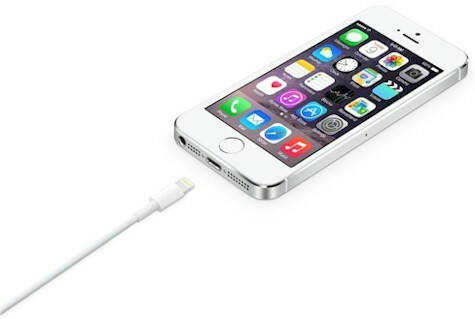 This USB 2.0 cable connects your iPhone, iPad, or iPod with Lightning connector to your computer's USB port for syncing and charging. 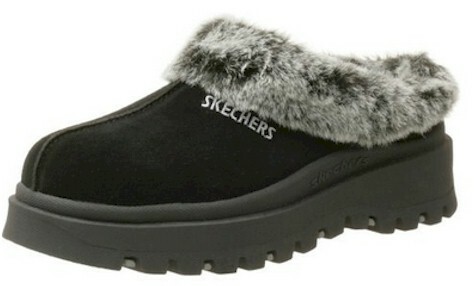 Amazon has got these Skechers Women's Fortress Suede Clog Slippers in black for $21.99, but enter promo code FALLSTYLE at checkout and that price drops by 20% to $17.59 with free Prime/SuperSaver shipping. Sizes 5-11 are available, including most half-sizes. These popular Skechers got 4.4 out of 5 stars over 500 customer reviews. 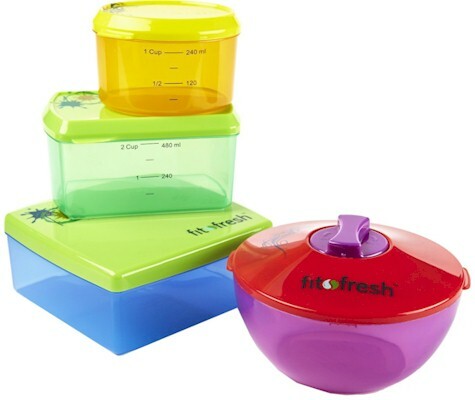 Amazon has got this Fit & Fresh 13-piece Kids' Healthy Lunch Reusable Container Kit with Ice Packs for $7.94 with free Prime/SuperSaver shipping, the lowest recorded Amazon price on this set. Each pod contains a lid and an ice pack. 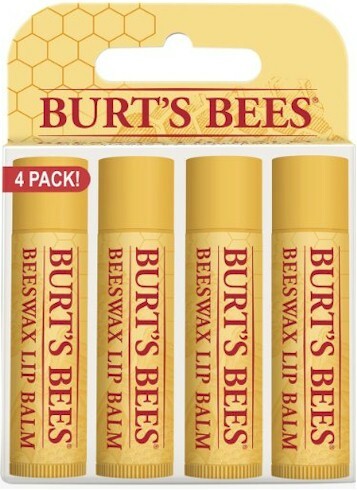 This popular set received 4.2 out of 5 stars over 66 customer reviews. For a limited time, buy a select ALEX Arts and Crafts toys and get another toy free. There is a selection of ten eight ALEX Arts and Crafts toys that you can purchase to get a second toy (from a selection of six seven toys) free. The free item must be added to your cart and the price of the free toy should drop off at checkout. Remember to add BOTH items to your cart and the cost of the free item should drop off at checkout (no promo code needed). 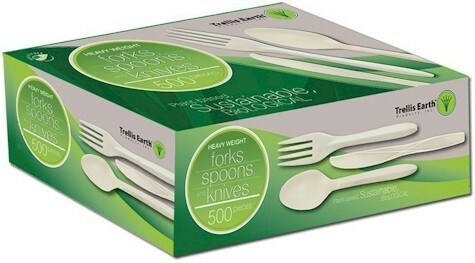 Amazon has got a very high-value 50% off coupon on this box of 500-count Trellis Earth Heavyweight Bioplastic Combo (Forks/Knives/Spoons) Cutlery, priced at $17.75 - 50% coupon = $8.87 with free Prime/SuperSaver shipping. That's slightly less than 2 cents per piece of cutlery. It got 4.4 out of 5 stars over 7 customer reviews. Now, I might not be the greenest person in the world, but I can spot a FANTASTIC deal when I see it. 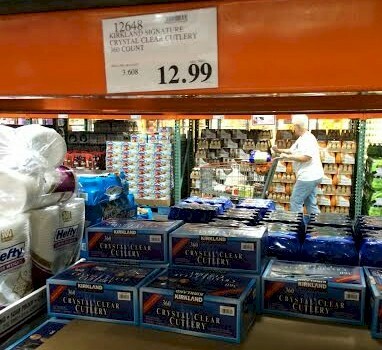 I normally buy the Costco 360-pack of disposable flatware for $12.99 (see immediately below), but this is a far superior deal moneywise, whether you are into recycling or not. 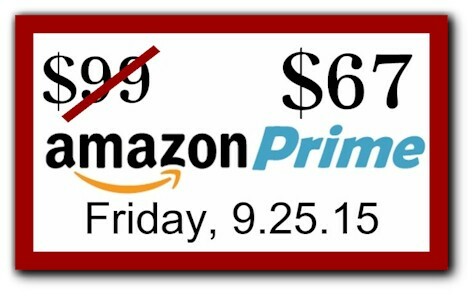 EXPIRED: AMAZON PRIME 1-year membership for $67, NEW MEMBERS ONLY! Today, NEW MEMBERS of Amazon Prime can buy an Amazon Prime 1-year memberships for $67 for 24 hours only, starting at Friday, 9/25/15 at midnight, Pacific time. That's a saving of $32 off the regular price of $99. Unfortunately, this price discount has been extended to new members only. Current members are not eligible. You also cannot give this membership as a gift. To obtain the discount, you must click through this link and add the Prime membership to your account. Although the price in your cart will appear as $99, the promotion discount will be applied at checkout. You will be charged $67 when you place your order. Unlike other Prime membership offers, there is no trial period attached to this special offer and the clock on your 1-year membership starts as soon as you check out. 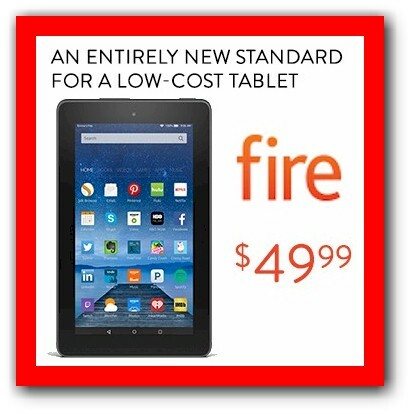 Amazon Fire for $49.99....Approaching release date at the end of the month....order now! If you haven't pre-ordered your Amazon Fire tablet for $49.99 yet, I urge you to do so before the release on 9/30/15. Why? Because there are rumblings out in the news media that Amazon might actually be selling the Fire below cost, and if that's the case, this pricing might not be sustainable for long. There have been $50 tablets out there since the iPad's invention, but let's face it: they were crummy, slow, cheap, do-nothing tablets. You got what you paid for. A week ago, Amazon released an brand new Fire for $49.99 shipped. And it looks like you are going to get a LOT more than you pay for. I can't seem to find a downside to this deal. "The breakthrough price of Fire combined with Amazon’s durable engineering opens up many new ways for you to upgrade your rooms: in the kitchen as a digital cookbook or to watch your favorite cooking show, in the TV room as an entertainment controller, in the bedroom to watch a movie or check the weather before you get dressed, and in your car for backseat entertainment." It's got 8 GB of storage but (unlike most other tablets) you can expand the storage by adding a 16, 32 or 128 GB memory card, as needed, which is a brilliant feature (why can't I do that on my iPad?). I think this is a terrific order, so don't let it pass you by, especially before holiday season. And, to ramp things up, if you buy five Fires, you'll get a sixth one free, with promo code FIRE6PACK, which lowers the price to $41.66 per Fire. Excellent for gift giving in the holiday season, but also fabulous if you want to get together with a few friends to lower your cost by a solid 17%. Amazon has got these four sets of highly-rated Minion Action Figures (from the movie Despicable Me), all for under $5.00 each. These are Amazon Add-On items, which means that each ships for free with a $25 minimum order if you are an Amazon Prime member (and their prices counts towards that $25), or each ships for free with a $35 minimum order if you're not a Prime member. You can order multiples of any Add-On item in order to help get you towards your $25 or $35 goal. 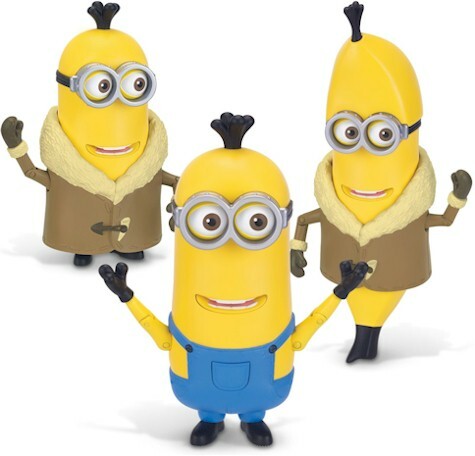 Minions Deluxe Action Figure - Build-A-Minion Arctic Kevin/Banana for $3.48. 5 out of 5 stars over 6 customer reviews. 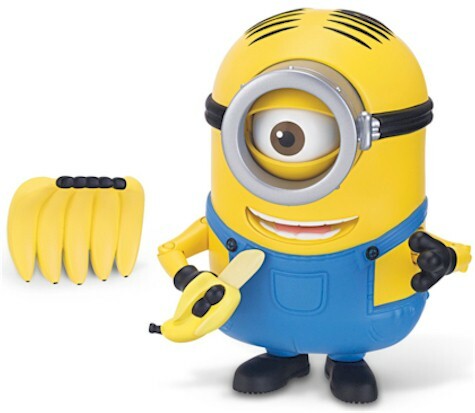 Minions Deluxe Action Figure - Banana Munching Stuart for $4.16. 4.9 out of 5 stars over 7 customer reviews. 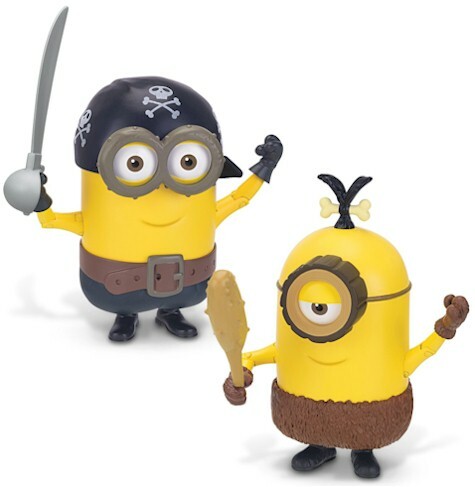 Minions Deluxe Action Figure - Build-A-Minion Pirate/CRO-Minion for $4.82. 4.9 out of 5 stars over 8 customer reviews. 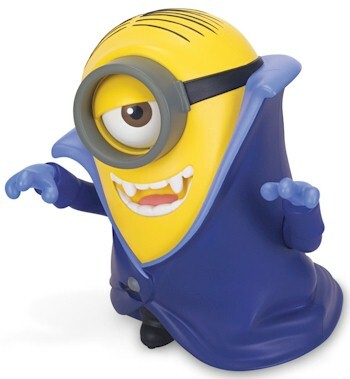 Minions Deluxe Action Figure - Dracula Minion Stuart for $3.79. 4.4 out of 5 stars over 5 customer reviews. 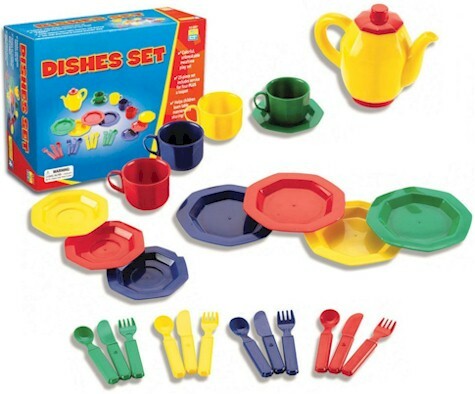 Amazon has got the Educational Insights 25-piece Dishes Set for only $5.34, the lowest recorded Amazon price on this set. This set is an Amazon #1 Best Seller. This is an Amazon Add-On item, which means that it ships for free with a $25 minimum order if you are an Amazon Prime member (and its price of $5.34 counts towards that $25), or it ships for free with a $35 minimum order if you're not a Prime member. You can order multiples of this item in order to help get you towards your $25 or $35 goal. This set has a fantastic rating of 4.7 out of 5 stars over 178 customer reviews. 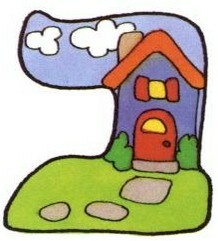 Helps children learn a variety of skills from sharing to table manners and vocabulary development. Use with play food to extend dramatic play. Includes service for four (plates, cups, and utensils) and a teapot. Shell Sheli is holding a last-minute Pre-Sukkot sale. Take 15% off sitewide when you enter the promo codeo SUCCOSSCRAMBLE at checkout. Additionally, Get free shipping on anything (with no minimum) at ShellSheli when you enter promo code STAYANDSAVE at checkout. Sale ends on Sunday, 9/27/15. And don't forget, Shell Sheli doesn't just sell shells. They also sell gorgeous modest skirts (under $50) and skirt extenders as well, With Shell Sheli, you can basically make almost any outfit modest! As September is drawing to a close, make sure you take advantage of this fantastic gift-card offer if you qualify. This is a new offer for September 2015, good only for select Amazon account holders. Log into your Amazon account first and then click here to see if you are eligible. If you are not eligible, the screen will say "unfortunately. you are not eligible for this offer." 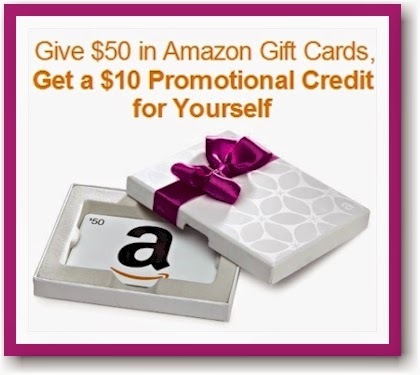 Just send a friend (or yourself) a $50 Amazon gift card before 9/30/15, use promo code 0915GCARDS at checkout and get a $10 Amazon credit for yourself (in the form of a promo code). Make sure you enter the promo code 0915GCARDS when you buy the gift card. You must enter the promo code in order to get the $10 credit. 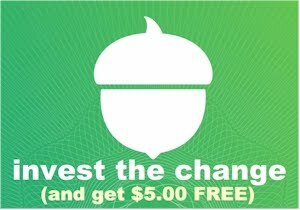 The free $10 credit will be sent within five days to the email address associated with the Amazon.com account used to purchase the gift cards. The free $10 credit may be applied only to eligible products sold by Amazon.com and its affiliates and does not apply to products sold by third-party merchants through the Amazon.com site. 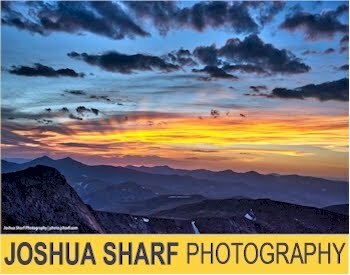 The free $10 credit expires on 11/15/15. Hand wash recommended. NO hot dry. Cold machine wash with air dry is fine. 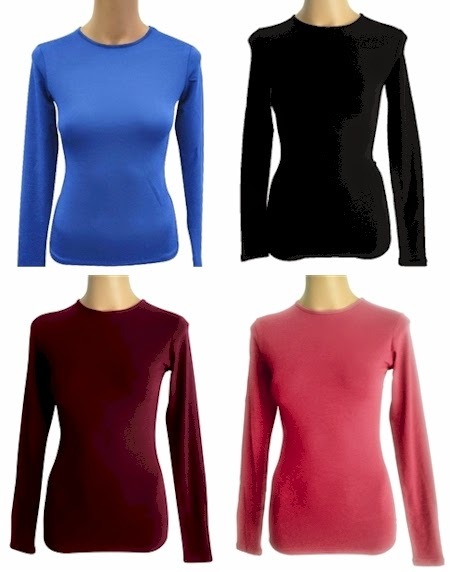 Great with any type of tops. 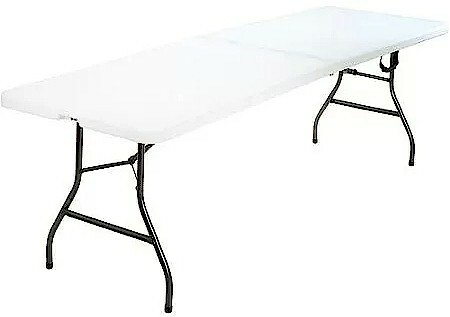 Walmart has got this Mainstays 8-foot folding table for only $59.97 with both free shipping and free in-store pickup. If you're buying this for Sukkot, you might want to pick it up at a local Walmart store in order to have it in time for the holiday. 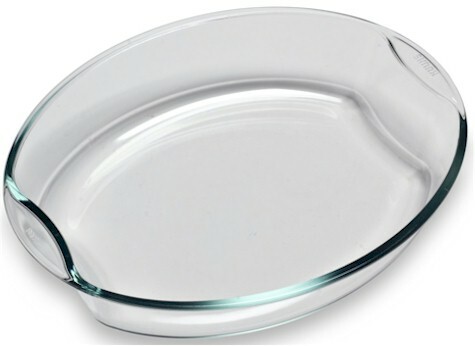 This Simax Glassware Smart Touch Oval Casserole has dropped way down to $4.59 on Amazon. This is an Amazon Add-On item, which means that it ships for free with a $25 minimum order if you are an Amazon Prime member (and its price of $4.59 counts towards that $25), or it ships for free with a $35 minimum order if you're not a Prime member. You can order multiples of this item in order to help get you towards your $25 or $35 goal. 2.5" x 12.6" x 9.85"
Crocs Gianna Flats for $12.50 (with promo code)!